As a small tip of the hat, the Yanks hired a plummy-voiced Rent-a-Brit actor in a futile effort to add some gravitas to the proceedings and tried to appease outraged Britons by way of saying that we had valiantly stood up to the Martians by way of being a way station for the passing of valuable strategic information, before yielding to the invaders. AAAAAARRRGGGHHHH!!!!!! BLOODY!! BLOODY!! BLOODY!! BLOODY!! Ahhhh, that's better. I now feel in an emotionally stable state and am the very model of bliss. Here's the review. I have been to the Bournemouth International Centre a couple of times for concerts and it is very much on a par with the Brighton Centre in the way of its size, seating arrangements and when it was built. A week or so prior to tonight, my girlfriend and myself went up to Wembley Arena for another concert. However, someone had the presence of mind, or lack of it, to chuck themselves on the line near East Croydon. As a result, we were stuck on the train for two hours while they sponged him off the rails. as a result, we did not get to our destination until 9:30 and we had missed an hour of the concert. Fortunately, no public transport was involved and we took the precaution of setting out with more than ample time to get to the venue. After a leisurely drink at the bar we made our seats. We saw that the venue was a sell-out and I was very pleased with myself that I had ordered the tickets 4 months in advance. The stage was divided into two sections. On the left hand side of the stage was the area devoted to the Black Smoke Band. The Black Smoke Band was a 10 piece consisting of acoustic, lead and rhythm guitars, bass guitar, assorted percussion and drums. on the right hand side was the area devoted to the UllaDubUlla Strings;a string section consisting of over 20 violinists, cellists and double bass players. Slap-bang in the middle was the podium reserved for the man of the moment;Jeff Wayne. As a man who was born in New York and saw the movie versions, even he thought that his peers and countrymen were taking liberties with the novel. In realising this, the seeds of something great and truly original began to germinate and take root... . Above the stage was a large projection screen, about 20 feet high and stretching the width of the stage. From our vantage point in the balcony, we could see there was the image of a closeup of the cabin section and portholes of a Martian war machine. Somewhere in the lighting rigging was a camera, scanning and panning around the audience. The image was then projected as part of the cockpit with the audience members looking out, all shaded in a fetching shade of green to keep in context with the shading of the cockpit windows. Typically, people were waving at the camera when they saw their image on the screen but a few were making two-fingered salutes. Both me and my girlfriend decided that if the camera focused on us, I would strike some suitable catalogue poses and my girlfriend would show some of décolletage. For some strange reason, the camera did stop on an unsuspecting member of the audience and do a close-up on his groin. This did cause some hilarity amongst the audience. The lights dimmed as the band and orchestra made their way out onto the stage. Taking their seats and then performing the time-honoured ritual of tuning up. It was then that Jeff Wayne walked out on stage to rapturous applause. With a wide grin on his face, he took his place on the rostrum, the stage went completely dark and the show began. The projection screen lit up with the image of a tripodal conveyance striding across the arid Martian desert to a building where numerous Martians are gathered. They are planning conquest. The object of their plans is a holographic, translucent image of Earth, hanging in mid-air. The conspirators decide that Mars, their home planet is dying and the move to a younger, more verdant world is required. It has been realised that Earth has brought forth a primitively intelligent race;one that can be bent to their will and used to their advantage or crushed underfoot. Plans are drawn up for their conveyances to be modified to become war machines and huge cannons built in the deserts will fire them forth to claim Earth as their own. "No one would have believed, in the last years of the nineteenth century, that human affairs were being watched from the timeless worlds of space. No one could have dreamed that we were being scrutinised as someone with a microscope studies creatures that swarm and multiply in a drop of water. Few men even considered the possibility of life on other planets. And yet, across the gulf of space, minds immeasurably superior to ours regarded this earth with envious eyes, and slowly and surely, they drew their plans against us..."
It was at this point that Justin Hayward, former lead singer with The Moody Blues and the voice of the thoughts of George Herbert strides out to stage centre to deliver the ultimately futile words of his friend; "The chances of anything coming from Mars are a million to one they said. But still they come..."
The artillery shell-like projectiles are hurtling towards Earth and the first one impacts on Horsell Common in the leafy county of Surrey, just outside London. Crowds of curious bystanders cluster around to see what this strange object is that has fallen from the sky. As the UllaDubUlla strings and the Black Smoke band launch into the next segment, up on the screen, the top of the cylinder is slowly unscrewing and we are treated to a sight of the monstrosities that reside within. The designers of the screen graphics pulled no punches and treated us to the sight of the emerging Martians in all their slobbering, tentacled, leathery-skinned glory. One of the predominant shots was that of one of the Martians posing on the edge of the cylinder, sensing that victory was in his/hers/its grasp. All of a sudden, a bright spotlight starts panning around the auditorium, mimicking the Martians deadly heat-ray as they emerge and start to construct their war machines. One thing I will ringingly endorse is the way in which Richard Burton has been brought back 'to life' in order to be the face of the narrator. The art of computer animation has come on in leaps and bounds and the image that was projected onto a cloth screen set off to one side of the stage was truly lifelike in its appearance. Using original photos of Richard and combining them with computer stills of a young actor who has portrayed him on stage, the images were combined digitally to produce a result that was nothing less than stunning. The actor spent time recording all the spoken narrative sections and the recordings were then lip-synched with the digital Richard Burton. Admittedly, in a couple of sections, the narrators head and shoulders were a little jerky and reminded me of the 'computerised' TV host; Max Headroom, but on the whole, the effect was breath-taking. 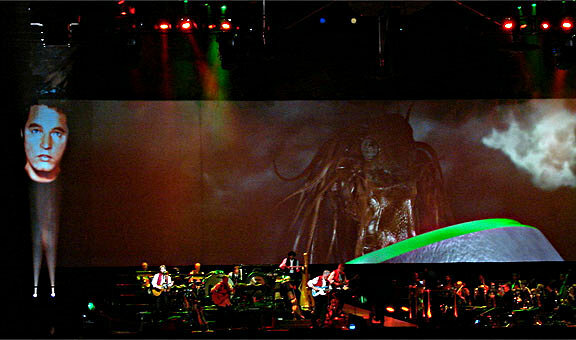 Unlike the previous tour in 2006 where a static image was projected onto a large head-shaped moulding, the projected image could turn its head at choreographed moments in the show and look at, speak to and interact with the live members of the cast . Now comes the part we have all been waiting for. The bit where the gloves are off and Humanity and the Martians are squaring up to each other. Teetering on their three spindly legs, the newly built war machines are emerging from their craters and are off, rampaging and razing all before them. Again, filmed actors were combined with computer-generated imagery to show footage of Victorian artillery, resplendent in their uniforms, lined up in a row as the War machine advanced upon them, up on the screen. Despite their best efforts and repeated cannon fire, the actors are incinerated and the Martians are allowed to continue, unimpeded, as they run amok across the English countryside. Footage of the artillery being routed is combined with that of the Martian in the previous footage, slobbering triumphantly as it emerges from the cylinder. 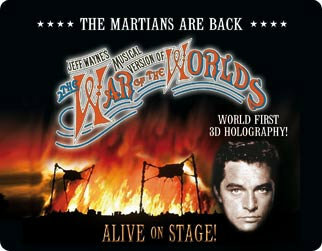 Alexis James reprises his role as the only surviving member of the artillery from the first original 2006 production and warns The Narrator that the Martians are unstoppable before he flees, covered in grime and beside himself with grief, rage and madness at the wholesale slaughter he has just witnessed. "Forever Autumn" is one of those songs that is instantly recognisable and is a lament to times past that the The Narrator spent with his betrothed, as he makes his way across a devastated London in order to seek her out. Justin Hayward come back out on the stage to sing the haunting lyrics as, up on the stage, his beloved; Carrie wanders down a leaf-strewn avenue and seats herself on a park bench and stares into a future they might share one day. 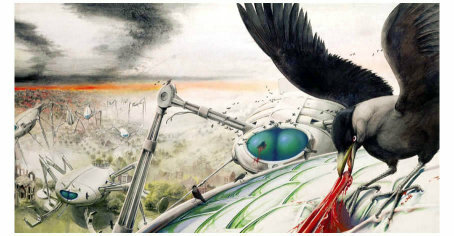 The onscreen visuals take on a darker note as the images of Carrie are replaced by those of the original paintings from the artwork of the album, showing a crowd of people fleeing in panic as the war machines advance upon them. As he continues his wanderings, more and more people join the throng until, up on screen, a veritable exodus of people leave a ravaged London behind for the comparative safety of the coast. During the course of these songs, the first of the major stage props is revealed. It is very hard to conceal a thirty foot high mock up of a Martian war machine on a stage but the stage hands and riggers had a bloody good try. Slightly protruding from underneath the stage lighting was a trio of alien looking and mechanical legs and tripodal metal feet. As the collective musicians played their hearts out, the mock up was lowered down towards the stage. I momentarily had concerns for the third violinist in the second row, that she would be squished underfoot by one of the feet but however, a space had been cleared in the orchestra for the war machine to rest all its feet on terra firma. And what a sight it was . With its cockpit windows glowing a baleful green and for all the world reminding me of a pair of giant green buttocks poked through a hole in its fuselage, and its heat ray belching out dry ice vapours, this was a very impressive stage prop indeed... . . The next section is reached and up on the screen, there is a temporary cessation of bloodshed as;at last, the narrator reached the coast and looking around among the tired and confused mass of Humanity that filled the dock area, he sees his beloved Carrie on the deck of a small steamer, ready to whisk her all away to France and safety. The combination of live action and computer animation is present once again as the steamer pulls away from the dock and makes its way out into the English Channel, only to be blocked by a trio of war machines that are wading throught the waters near the shore. It was at this point that another of the singing celebrities made his appearance. The name Chris Thompson may not ring many bells but when you mention the Manfred Manns Earth band song;"Blinded by the light", you will probably go "Aaaahhhh" in recollection. Out he strode onto the stage, wearing a fetching red waistcoat like the members of the Black Smoke Band, he sings about the ironclad that is the 'Thunder Child'; pride of the Royal Navy and the last hope to defeat the Martians. "When the smoke had cleared, the little steamer had reached the misty horizon, and Carrie was safe." "But the Thunder Child had vanished forever, taking with her man's last hope of victory. The leaden sky was lit by green flashes, cylinder following cylinder, and no one and nothing was left now to fight them. The Earth belonged to the Martians!" Phew, what can I say about the first half of the show once the intermission was upon us. A well deserved break to discuss what had just transpired and a chance to have a quick flick through the programme that I had bought before the show had started. I wanted to go for a pee but would I be able to brave the queues and get back for the second half?I opted for the easy option of diverting my attention away from my grumbling bladder and waited for the second half of the show to begin... .
Once again the house lights dimmed as the orchestra began with a stark and eerie rendition of what life would be like under the 'heel' of the Martians. Again, the projected facsimile of Richard Burton is called into play as he wakes to an alien dawn. Unknown to him as he slept, the Martians had been busy. On the screen, blood red tendrils began to leisurely open, frond-like, as the red weed gradually creeps across the landscape. The languorous music reflected its slow but inexorable progress, consuming our native vegetation before it. The song;The Spirit Of Man is, another of the defining moments of the spectacle. Out onto the stage, blinded by dust, religious fervour and blind hatred stumbles the musician John Payne as Parson Nathaniel. One the original sound track, the late great Thin Lizzy front man; Phil Lynott played Parson Nathaniel but John Payne is a worthy successor to him. Literally foaming at the mouth with righteous fury and clutching a cross to him like a shipwrecked mariner clutching onto a piece of drift wood, he begins a proper fire-and-brimstone tirade against the Martian as his wife Beth, played by the very comely Sinead Quinn, pleads with him to stop bringing attention to himself and to search within him for a means to escape the madness that threatens to envelop him. I know Parson Nathaniel was a man devoured by religious fervour and saw the Martians as agents of The Devil but John took it one step further and was bellowing his hatred of the invaders, blind to everything but the need to bring divine wrath down upon the interlopers. The Narrator comes across the tragic scene of the Parson and his wife in their struggle and offers to help. But for Beth, help for her husband has come too late and she runs back into the Vicarage in an agony of sorrow, only for it to destroyed and for her to be killed, when another Martian projectile hits it. The Parson is inconsolable with grief and the Narrator can only offer scant help and his ravings attract the attention of the Martians. His ravings bring forth another weapon in the Martians arsenal. On the screen, the Handling Machine is revealed;a squat spider-like conveyance with multiple articulated arms and a basket-like contraption on its back. Desperate to quell the Parsons ever-increasingly loud ravings, the Narrator strikes him unconscious with a blow of his fist. Before the Parson can be dragged to safety, a long metallic arm snakes in and grabs the motionless form of the Parson. On the screen, the Parsons still form is seen in silhouette, unresisting in the Handling Machines grasp, as it is lowered into the collecting basket, and to his unspeakable fate and demise. Ever seen a Martian shooting up? That is the fate which awaits their victims as Human life-blood is drawn from their bodies and shown in loving detail on the screen as the aliens cut out the middleman of eating and inject the nutrient rich blood straight into their leathery epidermises by way of getting their sustenance. Alexis James makes a welcome return as the Artilleryman but the events have been something of a trial for him. Seeking shelter in a ruined house, he begins to tell the Narrator of his grandiose plans and of a new renaissance for Humanity. In this instance, the Artilleryman is delusional and the Narrator can only sit back and listen at what he describes. The next major stage prop is then lowered onto the stage and what a prop it is. A wrought-iron bridge spanning most of the stage with its ends touching the wings, elegantly decorated with mock Victorian lighting, it made the ideal platform for Alexis James to pose upon as he sung about his vision for a subterranean Victorian Utopia. A world where the values of the old British Empire would be firmly upheld as we burrowed under the 'feet' of the invaders and sprang up in their midst to take back what was once ours. Staring into the middle distance, he sang about what would be achieved and how the Human race would rise one day in the future;revived and revitalised. Running down from his lofty parapet, he drags forth a table and chair and, clutching a bottle of champagne and a glass, he raises a toast, both to the projected facsimile of Richard Burton and to the future only he can see. At last, realisation sinks in as he lowers his head and tastes the bitter truth that what he envisages is only a pipe-dream. All he has to show for his towering ambitions is a shallow hole dug in the floor of the cellar, a mocking tribute to all he hopes and wishes for. "As life returns to normal, the question of another attack from Mars causes universal concern." "Is our planet safe, or is this time of peace merely a reprieve? It may be that across the immensity of space, they have learned their lessons and even now await their opportunity. Perhaps the future belongs not to us, but to the Martians." 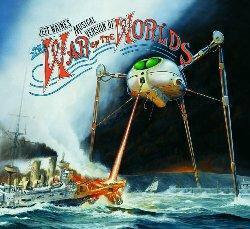 Well, what more can I say about War of The Worlds? It is many things. Part concert, part stage play and definitely a multi-media extravaganza that you would be mad not to see. 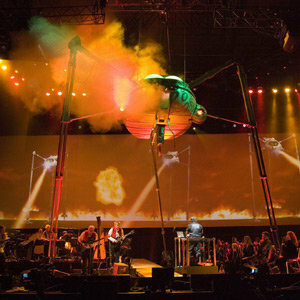 If Jeff Wayne and his cohorts tour again in this year, go and see it, you will not be disappointed... Ulla! !